Antibiotic-resistant bacteria are a major public health problem throughout the world. In 2006, in accordance with the national guidelines for antibiotic use, the CHRU of Nancy created an operational multidisciplinary antibiotic team at one of its sites. In 2011, a cluster-controlled trial showed that the operational multidisciplinary antibiotic team (the intervention) had a favourable short-term effect on antibiotic use and costs. Objective Our objective was to determine whether these effects continued over the medium to long term (that is, 2–7 years after creation of the operational multidisciplinary antibiotic team, 2009–2014). Setting The 1800-bed University Hospital of Nancy (France). The effect in the medium to long term is measured according to the same criteria and assessed by the same methods as the first study. A cluster controlled trial was performed on the period 2009–2014. The intervention group comprised 11 medical and surgical wards in settings where the operational multidisciplinary antibiotic team was implemented and the control group comprised 6 wards without this operational team. Main outcome measure Consumption of antibiotics overall and by therapeutic class (in defined daily doses per 1000 patient-days) and costs savings (in €). The reduction in antibiotic use and costs continued, but at a lower rate than in the short term (11% between 2009 and 2014 compared with 33% between 2007 and 2009) at the site of the intervention. The principal decreases concerned fluoroquinolones and glycopeptides. At the site without an operational multidisciplinary antibiotic team (the control group), total antibiotic use remained stable. Between 2009 and 2014, costs fell 10.5% in the intervention group and 5.7% in the control group. This study shows that it is possible to maintain the effectiveness over time of such an intervention and demonstrates its role in defining a hospital’s antibiotic policy. This work was conducted in the same medicine and surgery wards at the University Hospitals of Nancy as the first study in 2011 and according to the same method, previ- ously described by Bevilacqua and al. The wards are divided in two groups: the control group, that did not have an OMAT (site 1, 6 medical and surgical departments, 484 beds), and the intervention group, which did have an OMAT (site 2, 11 medical and surgical departments, 720 beds). The specific order form includes the patient’s name, age, and weight, the prescriber’s name, diagnosis, type of antibiotic therapy (prophylactic or curative, and the latter either empirical or for an identified infection), the specific antibiotics prescribed (dose, formulation and mode of administration, and duration of treatment). Every new prescription, including all of this information, is sent to the hospital pharmacy where pharmacists specialised in infectious diseases assess its compliance with local guidelines (Hospital Antibioguide, based on national guidelines). The initial delivery of antibiotics is first lim- ited to 24 h for prophylactic use, 4 days for empirical treatment, and 10 days for treatment of identified bacteria. To continue the treatment beyond these periods, the physician must write a new prescription. At the intervention site, the pharmacist identifies the cases that do not meet local standards or the applicable guidelines. They are reviewed with the infectious disease specialist (who comes to the pharmacy routinely 2–3 times a week). The OMAT meets with the physician who wrote the prescription to review it, considering the patient, the clinical context and the laboratory data. The physician can accept the changes in antibiotic pre- scriptions proposed by the OMAT or refuse them without any justification, except in particular clinical situations. At the control site, which does not have an OMAT, a pharmacist analyses the prescription. If prescriptions do not correspond with guidelines, the pharmacist contacts physicians by telephone to discuss the appropriateness of their prescription. 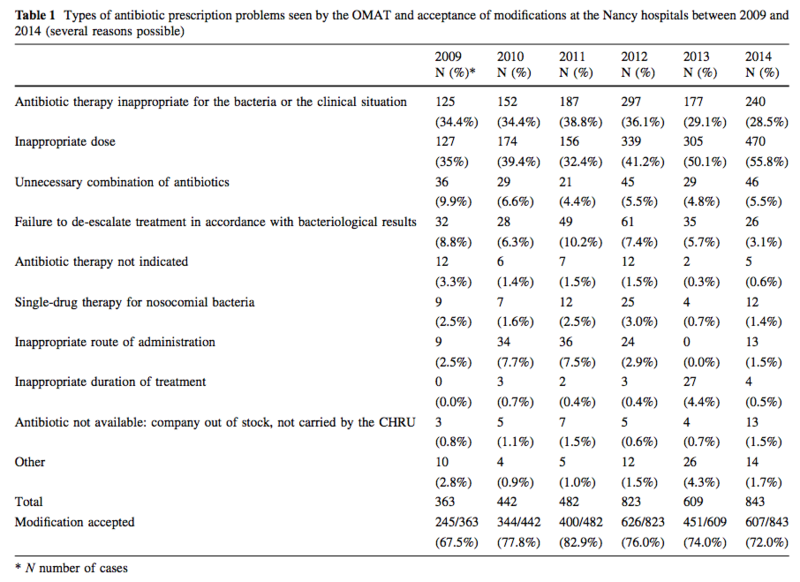 The assessment of antibiotic prescriptions and OMAT activity from 2009 to 2014 concerns only the intervention group. We studied the following indicators: (i) annual number of antibiotic prescriptions and types of antibiotic therapy (prophylactic, curative empirical, or curative for identified bacteria), (ii) rate of adequately filled out prescriptions, and (iii) rate of prescriptions meeting local or national guidelines, classified as compliant, non-compliant, or for a situation without guidelines, (iv) OMAT interventions: number and rate of interventions (number of interventions divided by the number of prescriptions validated), the types of problems observed for the prescriptions of specific antibiotics or classes of antibiotics, the number of OMAT proposals to modify treatment, and rate of prescribers’ acceptance of these proposals (defined by the number of new prescriptions written after a request for modification). 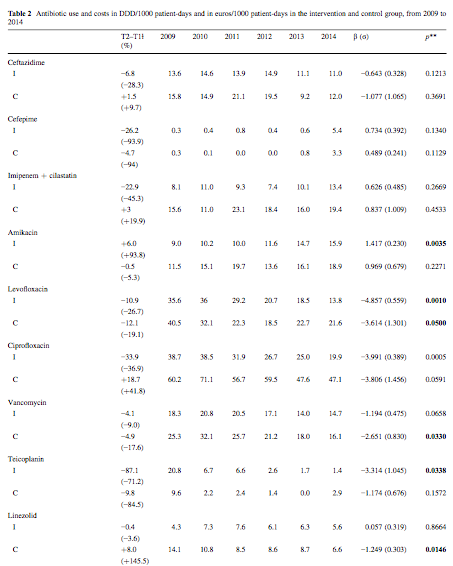 All these data come from an assessment of the phar- macy’s prospective follow-up of antibiotic prescriptions. As in our study of the OMAT’s short-term effects, we determined for both the control and intervention groups for each year from 2009 to 2014 the use of the following broad-spectrum antibiotics, measured in defined daily doses per 1000 patient days (DDD/1000 patient-days) and their costs in euros/1000 patient-days: broad-spectrum penicillins (piperacillin, piperacillin–tazobactam, and ticarcillin–clavulanic acid), cephalosporins (cefixime, cef- podoxime, cefepime, cefotaxime, ceftazidime, and ceftriaxone), aminoglycosides (amikacin, gentamicin, netilmicin, and tobramycin), fluoroquinolones (cipro- floxacin, ofloxacin, and levofloxacin), glycopeptides (vancomycin and teicoplanin), imipenem-cilastatin, and linezolid. Total use was measured by grouping together the use of each of these substances. Use data came from the ConsoResTM tool (created by Dr S. Boussat, CCLIN East), which makes it possible to express use in DDD/1000 patient-days from the quantity dispensed by the pharmacy to inpatient departments. The hospital pharmacy provided the costs, calculated per 1000 patient-days. To eliminate the price variations over the 6-year study period, all costs were calculated according to the costs of antibiotics in 2009. First, the departments included in this study were not randomised to either the intervention or the control group. Randomisation of departments would have been difficult because sites 1 and 2 are 5 km apart, and the infectious disease physicians at the Nancy hospitals are all located at site 2, in the infec- tious and tropical diseases department. The number of medical and surgical departments differed between the two groups, but this should not cause a problem, as the endpoint is trends in use over time. Second, our results should be supported by analyses of the progression of microbial resistance of antibiotics and patient outcomes (morbidity and mortality). Third, it should also be noted that the physicians and pharmacists trained in infectious diseases move from one site to another over their training and careers and thus can over time provide their expertise in the departments in the control group and thus affect the long- term results.